Ever been to an auction? Felt the fervor of a bidding war? If you’re in New York this week you can attend the Impressionist and Modern Art Evening Art Sales. By the time this posts Sotheby’s auction will have already gone off but Christie’s in Midtown doesn’t hit until Wednesday the 16th. An art auction, and seeing one at one of the most prestigious auction houses in the world is an experience. You sit in comfy seats and watch masterwork after masterwork being sold, many times to private collectors. Many of these private collectors will only display these works in their own private home, meaning this might be your only time, in your life, to see these works of art. Also if you get to the auction early enough you can preview all of the works, for free! It is only during these times that you are able to see an enormous collection of master works by a variety of artist within a certain movement, outside of a museum. Prior to attending the auction you can view each lot for sale on the perspective houses’ website, which I’ve linked below. The Impressionist auctions are my favorite to attend not only because I love Impressionist art but it is one of the better attended auctions, apart from Contemporary auctions. Evening auctions also tend to be more heavily attended. 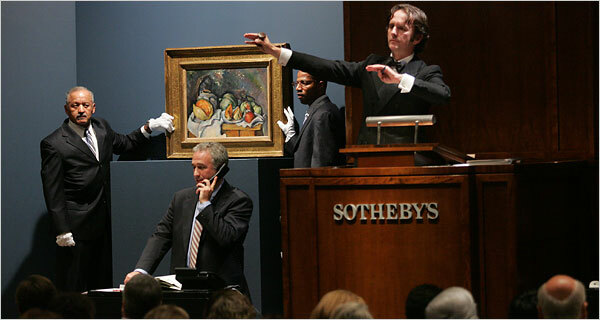 Attending an auction at Christie’s or Sotheby’s is a worthwhile experience. You are sitting in auction houses steeped with history dating back to the 1700’s. Sotheby’s was established in London in 1744 and Christie’s, Sotheby’s main rival, established a little over twenty years later in 1766. There is a certain reserved excitement that you feel at an auction, especially when you are in one of the bigger more established houses. Bidding is even more exciting. There is an art to it. Knowing when to jump in and whether or not you’ll land on the “right foot”. It is easy to become overwhelmed and over bid or not big enough. I went to graduate school at Sotheby’s. One of our classes covered bidding and it is quite complex if done right. The real stars of the auctions are not necessarily the works of art themselves but the auctioneer. Watching them you understand why people spend more than they were initially willing. The New York Times article: Going Once, Going Twice: The Art of the Auctioneer, gives a glimpse into what it takes to be an auctioneer at one of these big houses. The best in the business have over 20 years experience. It is their job to excite the crowd and get them to open their wallets wide. If you have the opportunity go see one of these great auctions and experience the thrill of this unique aspect of commerce. Auctions occur quite regularly. You can check the auction house websites for their event calendars. Until next time, life happens so travel now!